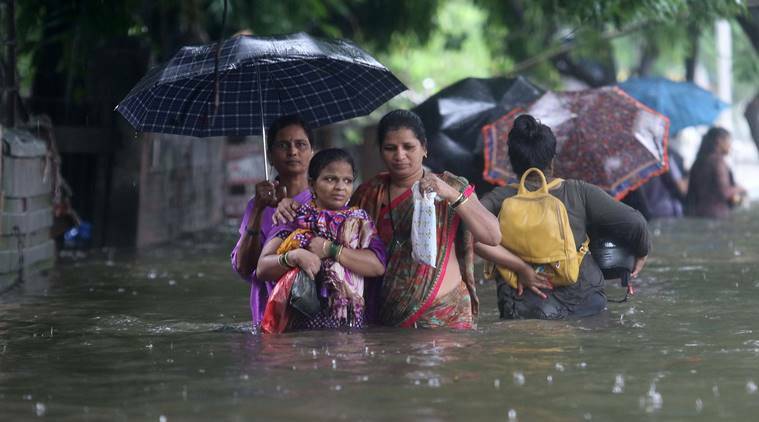 “If the heavens fall, what can we do?” That about sums up what an irate Mumbai Municipal Commissioner said to the media after Tuesday’s floods. In a way, Ajoy Mehta’s angry response was justified. All day long, every television channel was beaming footage of flooded streets, marooned cars, stationary trains, men and women wading through water. Television “experts” (me included) heaped blame on the BMC. The more aggressive channels shouted, “Municipal Commissioner, give us our Rs 440 crore back!” that being the sum supposedly spent on flood control measures. What Mehta saw were the positives: All the BMC services were running — there was BEST power, water supply, only one wall collapse. All the water pumps functioned faultlessly so that 9,000 million litres of water (equal to two Tulsi lakes) were pumped out in five hours. All this was achieved because municipal employees worked tirelessly. To Mehta’s positives, we can add our own: The police force acquitted itself admirably. If it was difficult for people to wade through water, it was even more difficult for policemen to carry on working in those conditions. As Anand Mahindra, in a tweet, pointed out, in Houston, Texas, the police had to stop people from looting stores during the floods; here people did just the opposite — they helped others in distress, gave food packets to stranded passengers. There are so many stories of small acts of heroism everywhere, that I, as a Mumbaikar, feel proud that in times of great calamities, the city’s human spirit asserts itself in so many noble ways. When Nature vents her fury, we human beings realise how puny we really are, but our courage lies in doing what we can. When the dust has settled, and the water has receded, however, we have to ask the central question: Must it always be so? In the age of technological advances, must we always plead helplessness when Nature decides to strut her stuff? The much maligned India Meteorological Department (IMD), apparently had warned of a deluge-like situation a day earlier. Why was this not heeded? Is this part of our national trait to fight heroically when the emergency happens, but not to take preventive steps when the effects of the deluge would have been reduced by closing schools and colleges and issuing a general advance warning? Why wasn’t that done? Is it because of the IMD’s poor track record that the state didn’t take its warning seriously? The IMD has an excuse for its continuing failure. It says it just does not have the computing power to process all the data from satellites, but the state does nothing about it. In the same way, one of the important instruments for accurate weather forecasting is the Doppler radar which measures “precipitation in a thunderstorm”. The whole of India has 10 of these (UK, by the way, has the same number, although it’s no bigger than a large Indian state). Twenty-five more have been approved, while the plan is to ultimately have 55 Dopplers. Alas, time and Nature wait for no man-made delays. Other man-made delays abound, but before we get to that, one simple question: What is the role the TV medium assigns itself? All channels continuously castigated the BMC and other authorities over their failures. But surely that could have waited for a post-mortem the next day? The important thing was to keep citizens informed about the precise situation, hour by hour, area by area. Instead, what we saw was the same general footage of a drowning city, some of it shot at noon and shown again and again till late in the evening. Mumbai has a real problem at high tide, especially in low-lying areas; the problem reduces considerably at low tide. High tide on Tuesday was at 4.30 PM, low tide at 11.30 PM. Therefore, it was foolhardy to venture out between noon and, say, 5.30, while at 9 PM, most streets were clear (I went into a dry Worli at that time when it was flooded at 3 PM). If people had been told this by TV channels, they would have stayed put in their workplaces till the evening. If people had been told trains had stopped running, they wouldn’t have waited for hours at railway platforms. Television and radio reach a maximum number of people; telephone helplines are useless because they soon get jammed. An alternative solution in this day of the ubiquitous mobile phone is for the state government to start an emergency app which gives accurate and vital information. Now to the difficult part. Difficult because it needs two things that seem impossible for the bureaucracy to grapple with — planning and implementation. The records for one day rainfall in Mumbai are 944 mm on July 26, 2005, 576 mm on July 5, 1974, 315 mm on Tuesday August 29, 2017 and 233 mm on August 29, 2011. These figures cover 43 years, so we could say the city gets one massive downpour per decade. But actually, that’s not so: Three of these deluges have happened in the last 12 years. We know why: Global warming, or climate change, is now biting hard. Common sense tells us that it will be too expensive to have a system that is able to cope with these extreme eventualities, but surely an efficient system that can effectively manage the normal annual maximum rainfall will make abnormal conditions less painful? What answer does the BMC have to the slow progress in implementing the BRIMSTOWAD plan formulated in 1985 to expand the stormwater capacity of the city’s drainage system? The Mithi river comes up in conversations again and again, but its cleaning-up seems to be done in a very routine way. These two measures really need to be taken up as if nothing else mattered. But something else does matter. And that is the official attitude to the environment. As this newspaper has pointed out editorially, “there has been little inclination to place the restoration of wetlands at the centre of flood control programmes.” Politicians see development as being what developers do, which is to build, build and build. The importance of open spaces, of checking concretisation and construction and the protection of mangroves and salt pans is never understood. If these continue to be neglected as they now are, August 29, 2017 will return as an annual event.